Two boys aged 11 and 13 have been arrested on suspicion of arson after a four-storey building was destroyed by fire. 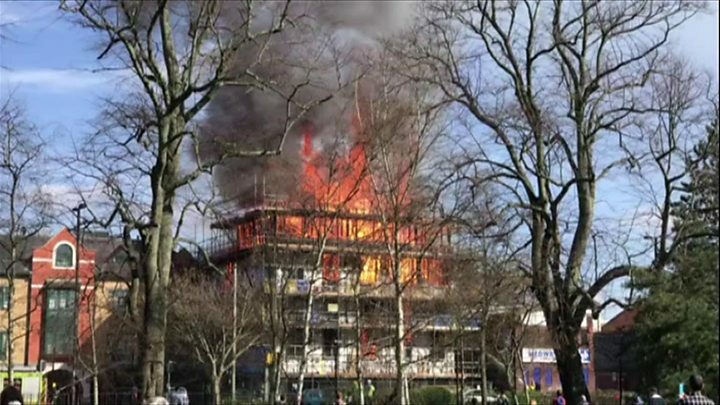 The blaze broke out at the commercial property under construction in Southampton on Tuesday. The fire spread to the roof of a neighbouring block of flats in St Mary Street, which was evacuated. Police said three men who were pictured on the roof of the building had been eliminated from the investigation. More than 70 firefighters tackled the blaze, which damaged neighbouring shops and homes. Some residents who were unable to return home were offered alternative accommodation by Southampton City Council. There have been no reports of any injuries, police said.